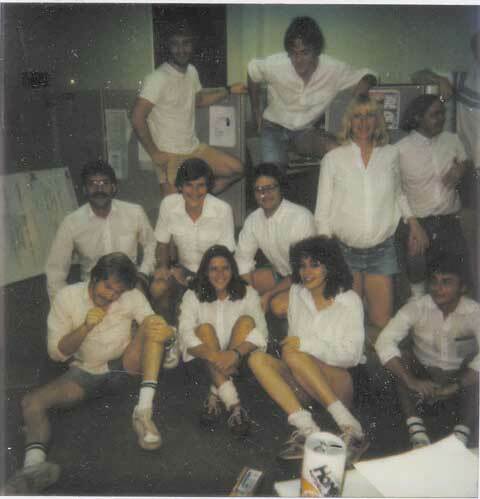 This faded, scratched polaroid depicts the Mac software team in December 1983, during the final push, all dressed up in white shirts and shorts in homage to Steve Capps' sartorial stylings. Top row: Donn Denman, Larry Kenyon. Middle row: Jerome Coonen, Hans Gerke (visiting translator), Andy Hertzfeld, a very pregnant Patti Kenyon, Burrell Smith (honorary member of the software team). Bottom row: Randy Wiggington, Rony Sebok, Susan Kare, Donatien (another translator). Capps and Bruce Horn are missing, since this was taken right before we surprised him. Thanks to Susan Kare for this rare photograph. 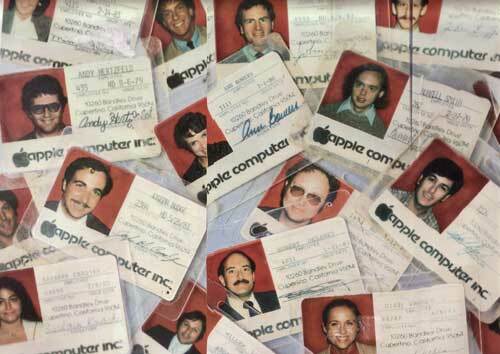 Here are the badges of a bunch of Apple employees, that were photographed for an ad (that was never run) in the summer of 1983 by Chiat Day. You can see Burrell and Andy's badges, plus some executives including John Sculley and Ann Bowers, the Apple Human Resources VP. 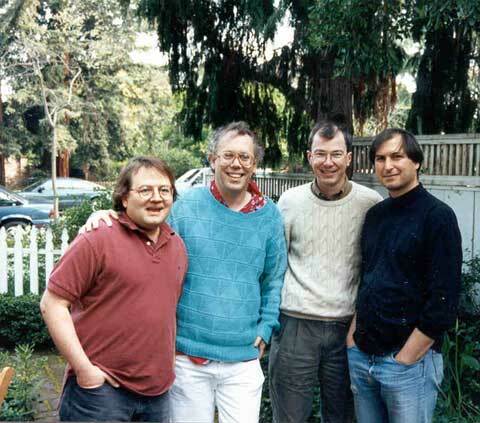 This picture of Andy Hertzfeld, Bill Atkinson, Bud Tribble and Steve Jobs was taken at Andy's 40th birthday party in 1993.